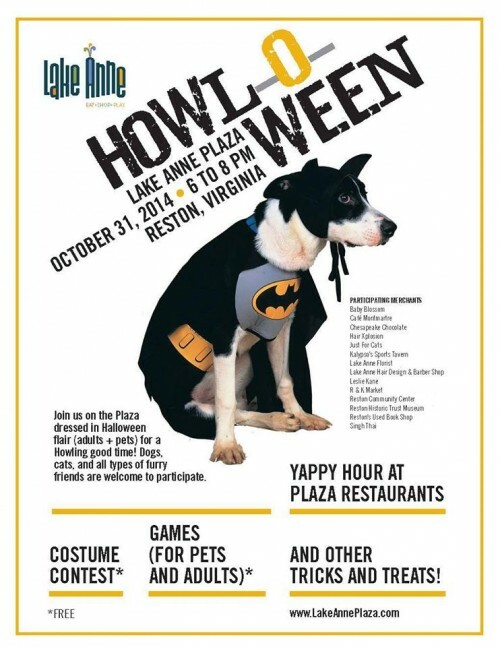 Join your favorite furry friends for Howl-O-Ween at Lake Anne Plaza from 6 to 8 p.m. It's going to be barking mad! Something about the air in October makes everyone want to get out and celebrate. And there is plenty to celebrate this October in Reston--every weekend in chalk full of fun activities for the whole family! Here are my favorite picks for the month. Everyone loves a good parade, so bring the family out on Friday, October 10 at 5:00 p.m. for the South Lakes High School homecoming parade, featuring the award-winning marching band and homecoming court. The parade starts at Hunters Woods Village Center, and travels down Colts Neck to South Lakes Drive, ending at the high school. After the parade, come to the football game and cheer the Seahawks to victory! For film lovers, the Washington West Film Festival provides a unique cinematic experience celebrating innovative, impassioned films that can make lasting, tangible differences in our world. Fine independent films will be screened or premiered in three in-competition categories: dramatic features, documentary features, and short films. Films will screen at the Bow Tie Cinema at Reston Town Center. Visit http://www.filmfest.com/ to learn about the films and for show times. Halloween House and Trick-or-Treat Trail Walker Nature Center - 11450 Glade Drive, Reston Friday, Oct. 24 and Saturday, Oct. 25 from 4:30-9:30 p.m. If your child is looking for a reason to wear his or her costume early, we've got the perfect excuse. Come on down to the Reston Town Center were participating retailers (and the information center) will have goodies on hand. Just look for the pumpkin flyer in the window! Okay dog lovers, time to show us just how flashy Fido can be. In this new event, your furry friend can strut his stuff at Lake Anne Plaza from 6 to 8 p.m. on Halloween night. There will be plenty of Yappy Hour treats. You don't want to miss this!